Antiquing or Ageing: A technique intended to give the appearance of age or wear. Borders: Stenciled and hand painted borders are used to soften the edges of rooms and ceiling lines and add interest to the space. Brocade stencil finish: A highly decorative stencil is applied in flat sheen paint over a broken color finish in a satin sheen. The stencil is repeated in a pattern, giving the walls the appearance of "brocade" fabric. Canopy or tented ceiling: A trompe l'oeil painting on ceilings depicting the inside of a canopy or striped tent. Children's Murals: Baby nurseries and children's rooms are perfect places to apply murals, either on the walls, ceilings or floors. Themes can vary from a circus tent, African savannah, and the stands of Fenway Park to a fantasy mural with castles and fairies. Color Wash/Old World: This finish creates the illusion of an old Tuscan plaster effect. By applying multiple layers we can create depth and movement and a hint of drama. Combing: A technique of pulling a toothed "comb" through wet paint. The comb can be made of a material such as: rubber, metal, leather, plastic or cardboard. Crackle: A finish in which cracking is intentionally produced, allowing the undercoat to show through the cracks. A rapid drying of topcoat over slow drying undercoat produces this interesting technique. Cross-hatch or Basket Weave finish: A technique of dragging a toothed "comb" through wet paint in both vertical and horizontal directions to achieve a "basket weave" appearance. Design: A sketch drawn to scale on grid paper, representing the final layout of mural composition. Distressing: Also a term used to describe a decorative paint finish that gives the appearance of age and wear. Faux Finishes: French word meaning "fake or false". Technically, wood-graining, marbleizing, or other painted finishes that are replicating a natural material are faux finishes. However, this term has become an umbrella name to describe all painted decorative finishes. Faux Wood Grain: creating the illusion of wood using tools and paint. Fresco: An ancient mural technique using wet pigments as paint on un-cured plaster. Faux fresco is a mural technique that gives the appearance of an aged and weathered fresco using contemporary paint products. Frottage: (in decorative painting) This comes from the French word meaning “to rub”. The decorative paint term denotes a technique of applying a wet glaze, then rubbing it with fabric, paper or other materials, to create a texture. Garland border: A traditional painted border that depicts various leaves, fruits and flowers in a swag design. Gilding: The application of metal in any form (gold or other metallic leaf, metallic foil, metallic paint, metallic powder, etc.). Glazing: Process of applying a tinted, but transparent paint over a base coat to create a softly modulated, watercolor effect. The darkness of the basecoat and the number of layers of glaze applied can create a rich saturated appearance and works well in dark reds, blues and greens. Grisaille: Architectural trompe l'oeil painting done in monochromatic colors suggesting solid form, perspective or decorative plasters motifs. Harlequin diamonds: Harlequin diamonds are painted in a pattern in either subtly contrasting colors or sheens and can also be applied in a subtractive paint finish, creating a classic and elegant appearance. Landscape murals: A mural that depicts the outside environment including the sky, the foreground and distant horizon line between the land or sea and sky. Marbleizing: A faux finish that creates the illusion of marble. Metallic finishes: Decorative finishes that use metallic paint in various techniques over other painted finishes. Golds, silvers and bronzes are used over different colored base coats to achieve the appearance of antique gold, burnished bronze or shimmering silver. Murals: A mural is defined as a painted picture on a wall or ceiling. On-Location Sample: A sample of the finish intended for the walls or ceiling is painted on a section of the wall in the room so that client can approve the finish before the entire room is treated. Better accuracy in color selection and texture is achieved when sample is done on the same walls and over the same base coat that the rest of the finish will be applied onto. Opaque paint layers: Any paint finish layer that is made from a pastel base paint with titanium pigment will soften and possibly lighten the affect of the decorative paint finish. Opaque paint finish layers allow the faux finisher to correct and soften the previous layers. Opentime: This is a faux finish term used to describe the time available to work a technique before the paint dries. Opentime™ is also a product used as an additive to any water-base paint to lengthen the drying time. This product is manufactured by Kingfisher Decorative Paints and can be ordered through this web site. Paint sheen: All house paints and glazing liquids have different sheens and can affect the success of certain decorative paint techniques. They will also affect the final look and appearance of the room. Paint sheens vary from flat (a non reflective, dull finish) to high gloss. Patina: A thin greenish layer that forms on copper or copper alloys, such as bronze, as a result of long exposure to the elements and often valued aesthetically for its color. It gives a surface appearance of something grown beautiful with age or use. Pigments: Material mixed into paint bases to create paint colors. Rag Roll: A decorative paint technique that involves applying or subtracting color by “rolling” a damp crumpled rag over the wall surface. Ragging: A decorative paint finish that is either applied or subtracted with a crumpled damp rag. Reference material: Pictures from magazines, books, Internet or personal photos that the artist uses as a guide in color selection, techniques, or mural painting. Sample: The finish that is to be painted on the walls or ceiling is painted on a section of wall or on a board to show the client what the final outcome of finish will be. Scene Painting: Traditional techniques used in theatrical set design production, involving many of the same skills utilized in mural painting and faux finishes. Sketch: Preliminary drawing of proposed mural painting. Skyscape murals: A mural that depicts mainly a sky. Sponging: A broken color effect produced by either applying color or removing color by pouncing with a natural sponge while paint is still wet. Stencil: A tool used to apply a repeated image or pattern by dabbing paint on a commercial sponge or stippling brush over the negative space cut out of a sheet of mylar or stiff oak tag. Stipple: A decorative treatment also known as"Pouncing". A glaze or paint is applied to the surface and while it is wet, a stippler is pounced onto the surface causing the glaze to disperse into tiny dots. Stippling gives a very even film of glaze while removing brush strokes in a wet glaze. Stone block: This is a trompe l'oeil technique giving the painted surface the appearance of a stone block wall. Strie: A technique used for achieving a subtle mix of fine stripes (or brush strokes) by pulling a dry, stiff bristled brush or rubber comb through wet paint. Stripes: Stripes are applied over a basecoat or faux finished surface in a width suited to the scale of the room. Stripes can be applied with a subtractive technique and in a subtly contrasting sheen creating a soft and rich effect. 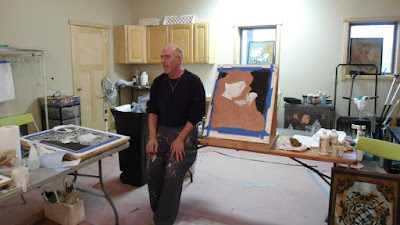 Subtractive technique: Any paint technique that is first applied and then “subtracted” with a sea sponge, rag, plastic bag, or other tool, creating a subtly textured effect. Texture: Paint finishes create various degrees of 2-dimensional texture by adding or subtracting gently contrasting color paint in the techniques described above. 2-dimensional texture adds warmth, character, and depth to an interior. Transparent paint layers: Any paint finish layer that is made from a neutral base or glazing liquid will be semi-transparent and will darken the finish with each additional layer. The basecoat color will be tinted by the transparent paint or glazing liquid. Trompe l'oeil: French expression meaning, "To deceive the eye". A painting technique in which an illusion of depth and reality is created by emphasizing highlights and shadows. In art, trompe l'oeil is defined as a 'still life deception', a painting able to make the viewer believe that an object actually exists in 3D space, in relief. It also means illusion, a deceptive appearance, eyewash or camouflage, in short 'Fool the eye'! Venetian Plaster: Involves the application of pigmented limestone and marble dust to create the look and feel of authentic stone.